Cloud technology is no longer synonymous with storage, but seems to be encompassing a greater role, one that also includes online document management. Whether you simply wish to make a backup of your files or access them while on the go, cloud services such as Dropbox, Google Drive, or SkyDrive offer great flexibility in document management. Among the many document related tasks that users perform online, sharing files in different file formats is one task that is quite tiresome. Finding the right online conversion tools, uploading and downloading them and then transferring them to the recipients involves time and in today’s fast paced world, where multi tasking is the norm, this lengthy process needs to be avoided. That’s where Cometdocs comes in. You might remember Cometdocs for its popular free online conversion services. Well, Cometdocs has now grown bigger and stronger and expanded its services to include document management services as well. One look at its Clipboard style interface or document manager, you know everything that Cometdocs can do for you. Its clean interface with tabbed options means that you don’t need to search for help or read up tutorials to get started. Let’s peek into Cometdocs and see what it offers. 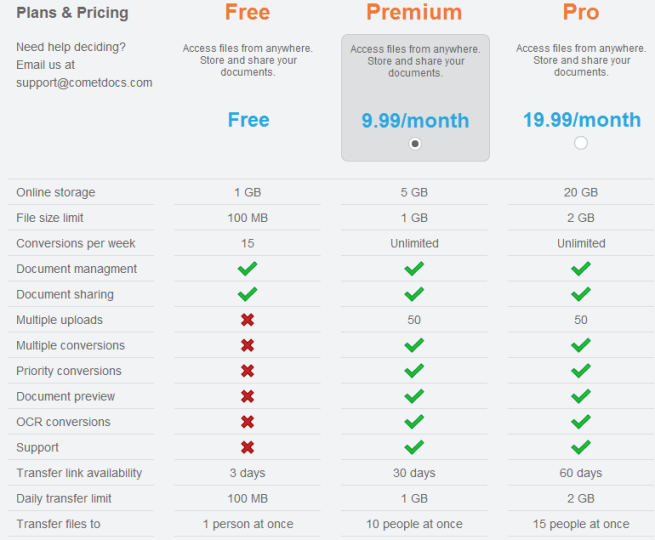 Cometdocs offers great value for those looking for free as well as premium document management services. Sign up for a free account and you get an online storage space of 1 GB, a file size limit of MB, 15 document conversions per week, and option to transfer files via a public or hosted link for up to 3 days. Don’t want to be a free registered user? Well, you can still take advantage of Cometdocs’ limited free-to-use features: 3 documents conversions weekly per IP address, 100 MB worth daily free transfers per IP, and hosted links available for a whole 24 hours. If you want premium services such as 5 to 20 GB of online storage, unlimited file conversions, multiple sharing and conversions, up to 50 simultaneous uploads, priority conversions, document previews, support, and more, you can choose between a $9.99/month plan and a $19.99/month plan. Drag &Drop: One of the most convenient methods of upload, Drag & Drop is available right away on Cometdocs and you can pretty much do all your document-related activities with the feature. File Storage: Now that you’ve uploaded files to Cometdocs dashboard as a registered free user, you can drag & drop files to your storage location. You can also do a host of other activities from the storage dashboard: download, edit metadata, convert, preview, share, move, see revisions, and delete. 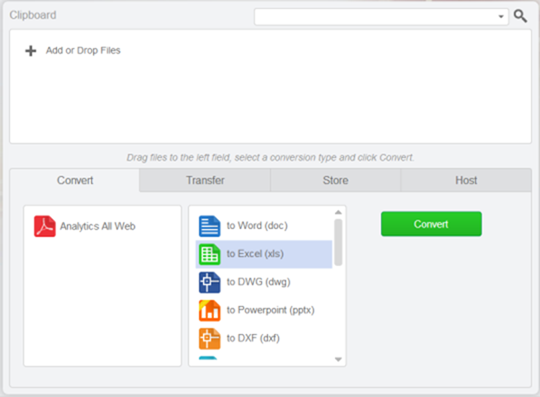 Online Conversion: Again, just a drag and drop action should have you converting files. DOC, XLS, or PPTX, ODS, ODT, TIF, TXT, ODP, JPG, DWG, DXF, BMP,and HTML are just some of the file formats supported. Transfer Files: Input an email address to send your files and it will be on its way. Again, a fairly simple process to do file transfers. 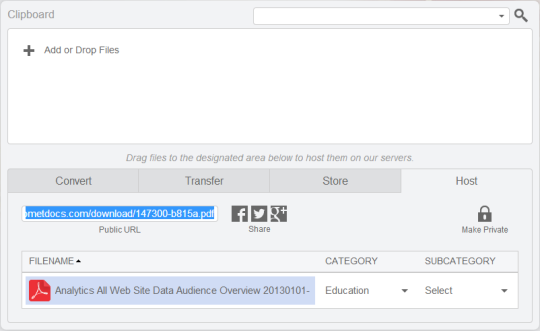 File Sharing: You can share documents online securely with an option to set the URL private or public in the Host tab, or using the Share button. You can also share files internally with other Cometdocs users. Settings: The Settings area offers options to enable or disable email notifications and sharing requests. Online Document References: You can also browse through the vast collection of documents shared by other Cometdocs users and download them. You might find it a good reference point for documents on various categories from science and technology to literature and lifestyle. Cometdocs features some of the most essential elements needed for a good document management system: multiple functionality, ease of use, optimum pricing and a few free services thrown in as well. The feature that I truly miss about Cometdocs is an app that will enable me to do what I can do on the PC on my Android and iPhone devices. If you are looking for a handy online document management tool that offers great value for zero bucks, give Cometdocs a try. And share your comments about what you think of the new Cometdocs.